It's not my job, nor my inclination, to convince children that descent with modification (evolution) serves as the linchpin of biology. It is my job, though, to present it competently, and I have faith that my students will (eventually) start to see how completely evolution explains what we know in biology. If I present it as the truth, though, I'm going to lose my few students vehemently opposed to the idea. Most students, however, don't seem agitated one way or the other, and find my enthusiasm mildly entertaining, and hey, look only 11 minutes left before we go to art class. There is no place for truth in science; there is no place for dogma. Humans observe the natural world, often indirectly, and create models to help grasp what they see. It is a wonderful way of thinking, and results in lots of useful predictions, and will continue to do so as long as the natural world continues to consistently follow laws. I have a small blueberry bush just outside my front door, laden with fruit. The deep blue excites my eyes, the sugary, blueberry flavor excites my my tongue. The plant creates desire, and I succumb to it. I get calories and joy, the blueberry bush wraps its seeds in my shite, we both increase our chances of passing our alleles ("genes") to the next generation. 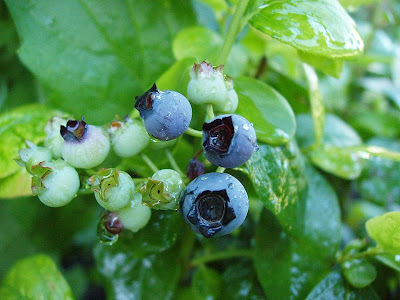 My desire is real, and I know that the blueberry bush created the fruit for me (and other mammals) to eat. The bush is not conscious of this, nor need it be, for evolution to work. The bush created the fruit for me misleads the student--if I have a strong desire (and I do) to eat the berries, and the bush has a good reason to encourage me to eat it, I've created a semblance of mutual desires. The thinking child may reason that if the bush is not conscious, then something must be helping the bush figure out what I want, and so we create a being from nothingness, a god, or rather, God. If the child sees this line of reasoning (and this is a huge leap), then, paradoxically, that child has a chance to develop a deep understanding of evolution. No consciousness is needed to see how a particular set of characteristics in a particular environment might lead to a better chance of reproducing. So long as there is variation between organisms that causes differential reproduction, and so long as some of these variations are inherited, no consciousness is needed. None. This upsets people, as it should. Most of us are irrational some of the time. Too many students come to my class "believing" in evolution, and tell me so, perhaps thinking that will impress me. It does not. I don't believe in evolution, I accept it as a powerful and useful explanation for the explosion of the variety of life on our planet. I do believe in things supernatural, but these matter not in my classroom. I could believe in יהוה, in Thor, in Lugh, or in 天児屋命; I could believe in elves and faeries; I could believe in Santa Claus and the Easter Bunny. I need none of them to explain what we know in biology, nor does my belief in any or all of them affect my ability to teach descent with modification. The photo has been released to the public. Doyle, I think this is exactly right. I was always careful to never use the word "believe" when teaching science. Accepting a preponderance of evidence always seemed better to me. "Belief" implies the supernatural and that's outside the realm of science. I don't really care whether students believe evolution, but I care whether or not they can understand evidence. Sadly, I don't think we do a very good job of teaching science that way. We could all use a bit more doubt these days, and good scientists will be the first to admit that they might be wrong. Anyway, I must admit that I've been lurking on your blog for some time now and I find your writing to be quite helpful. I'm currently working on some school policy work to get kids more experientially involved with their lived, messy, visceral environments. And so it goes. Thanks for the kind words. We have a state test in biology here in Jersey, and it's a bit confining, as "selected response" (multiple choice) tests will be. I know I need to do better job teaching process. I took the liberty of adding your blog to my go to list--any blog that opens with a quote by Wendell Berry and features Wilco's "California Stars" in a post becomes part of my daily vitamins. LOL - about that Easter Bunny; I'm a fan of any source of chocolate! When you think about one of my priorities as a science teacher, which is to teach healthy skepticism, you start to wonder why any potential students would ever believe anything I tell them. I want to teach them to question. Teaching evolution is enough to make me think about trying to get certified in biology. Of course as a chemist, I'd probably focus on the chem angle of protein synthesis but there you'd have it. I love chemistry, and it is an ideal way to introduce thinking. If we had the time to explore chemistry's historical roots, showing the observations that led to various hypotheses until we got to where we are today, I think most students would see that chemistry is a phenomenal explanation for the physical world, but that the symbols on the page represent a model reflecting the way matter behaves (and not the other way around--I think kids get the idea that matter reacts as it does because it must follow the laws of chemistry written in some book). When teaching the periodic table, it's fun to show the gaps in Mendeleev's original table, and to show why he was close, but not nearly close enough, and yet is still a huge figure in science. I totally agree about the Periodic Table and Mendeleev. It's also fun to teach the controversy and debate about atomic structure that raged at the trun of the 20th century - still not resolved and no, we really can't say exactly where that electron is located. Your point about kids not understanding that the book doesn't make the rules is important. So much to teach, so little time, and no students yet anyway. I think you've gotten to the core of the issue with this discussion in wording. It doesn't have to be an either/or situation. My wife and I just came back from a camping trip in northern Ontario where we saw evidence of evolution. We walked on rock beds with fossils, observed giant upheavals and collisions of rock which took place millions of years ago, we saw the inexorable advance of vegetation atop hard igneous rock and the animals which survive there so well. The key is finding the evidence of evolution not believing in it. Does the truth lie in empirical evidence? Few things in science (in life) are either/or. Does the truth lie in empirical evidence? Great question, though I'm not sure we ever get to "truth"--unless by truth you mean something empirically proven, and even that's tougher than it sounds. The mistake many make, though, is assuming that science is the exclusive path to truth, whatever "truth" means. There are plenty of things under the sun that science does not (and cannot) address. Amen! What a wonderful blog. I am so glad to have stumbled upon it and look forward to reading more.